Mason, who went 9-for-16 from the floor, also dished out nine assists and pulled down eight rebounds for the Jayhawks (28-3, 16-2 Big 12), who won eight straight games. 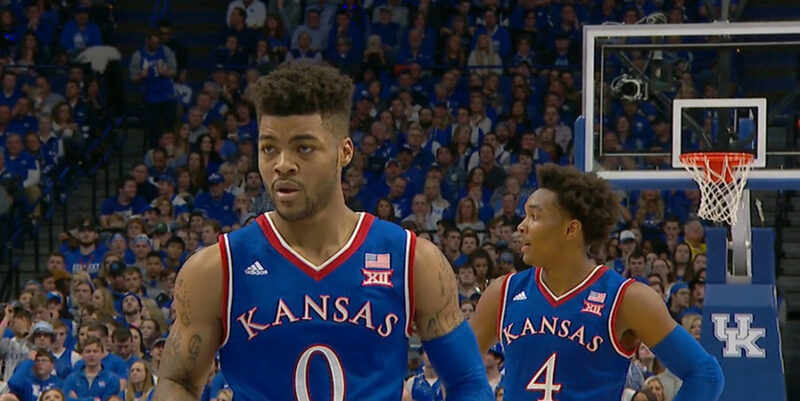 Freshman Josh Jackson added 17 points, nine rebounds and five assists, Devonte’ Graham, who became the 59th Jayhawk to reach 1,000 career points, chipped in with 13 points, Carlton Bragg Jr. scored 11 and Landan Lucas finished with 10 points and seven rebounds for Kansas, which heads into the Big 12 tournament firm favourite to run the table. Jeffrey Carroll led the way for Oklahoma State with 27 points and four boards, while Jawun Evans added 22 points and 15 assists for the Cowboys (20-11, 9-9 Big 12), who shot 42.3 percent in the defeat. Senior guard Phil Forte III scored 13 points and Leyton Hammonds finished with 10 for OSU. “It was different,” Forte said. “I was just trying to take it all in, to soak up every last moment of it, from just taking the court, to the fans, to pregame with my teammates, everything. Kansas led by as many as 12 points in the first half, but the Cowboys rallied to trim the deficit to 43-40 at halftime. Carroll scored 14 points at the interval for Oklahoma State. The Jayhawks now head into the 2017 Phillips 66 Big 12 Championship as the top seed and seeks its 15 conference tournament titles. They will take on either Oklahoma or TCU on Thursday in the quarterfinal of the league tournament, which runs from March 8-11 at Sprint Center in Kansas City, Missouri. No. 8 seed TCU and No. 9 seed Oklahoma will face-off on Wednesday night at 6 p.m.
Also at the Big 12 Tournament on Thursday, Oklahoma State will play No. 24 nationally ranked Iowa State, which is the fourth seed for the championships.